Let’s face it. The Beatles were magical. We all loved them no matter what we said, and our parents made fun of them, but they knew who they were. Our mothers dutifully took us to see their movies and I don’t think they minded sitting through them with us. The lads were adorable after all. I can speak for my own mother when I say that she found them much preferable to the likes of Jerry Lewis. When Hard Days Night came out, I was still way too dopey a kid to get many of the jokes, but when I saw Help I was a wee bit more aware and maybe a wee bit more mature, or maybe Help is jus the better movie, as I’ve always felt. 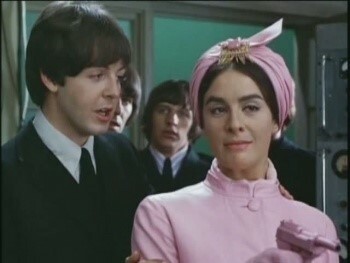 It has that wonderfully bizarre storyline, the charm of its four stars and the character actors like Leo McKern and Victor Spinetti, who also had a pretty meaty role in Hard Days Night, and the performance by the most excellent Eleanor Bron in her very first movie. Her character, Ahme, double-agent and champion of the Beatles, was the hero of the movie and an impressive force as a cool, confident, courageious and really smart woman who was also exotically attractive and impecably dressed in fashionable yet somewhat unusual attire. She has a delightfully droll exchange with Paul on the dance floor, but my favorite scene is (and I am doing this from memory as I haven’t seen Help in quite some time, though Hard Days Night has been showing up on television lately) later in the film when the Beatles are blown into the water and find themselves swimming in the ocean not knowing which way to go. Then on a reef or a jetty we see Ahme clad in a black leather caped maillot (that’s a one-piece bathing suit – fancy, huh) and a jeweled black bathing cap. She waves her arm way up in the air and delivers the memorable line, “Beatles! Hello!” to perfection, and she rescues them yet again. Tidbit: The character of Eleanor Rigby was named for Eleanor Bron. Bron was also the female lead in the Peter Cook/Dudley Moore film Bedazzled as the object of Moore’s nebishy shy Stanley Moon’s silent affection and the reason he makes a deal with Cook’s cunning devil for his soul. Bron is required to play several versions of her character and holds her own with the clever comedy duo. Tidbit: Raquel Welch turns in a magnificent performance as Lust. That was only the second time I saw Eleanor Bron in a movie, I think, and after seeing her in the Albert Finney/Audrey Hepburn movie Two For the Road, and performing with Monty Python’s Flying Circus, I knew I would be a fan for life. For those of you Ab Fab fans, she also played Patsy’s mother. Eleanor Bron has not just died, nor is it her birthday, but let’s salute her anyway, just because she deserves it, gosh darnit. I’d love to have my friends over to watch the movies I have mentioned, but I’ll bet that if this ever happens, I’ll wind up having my own private Bronathon alone.